In 2015, Latin America and the Caribbean achieved the two Millennium Development Goals related to poverty and hunger: by reducing the proportion of people living in extreme poverty by 66%, and the proportion of the total undernourished population by almost 63%. The region has also achieved the most ambitious goal established by the World Food Summit (WFS), to reduce by half the total number of hungry persons in accordance with data recorded at the start of the 1990s. Furthermore, the region has demonstrated significant progress on nutrition, such as the reduction of stunting prevalence by 12.9 percentage points over the last 25 years. However, malnutrition is an issue that affects society as a whole, although different population groups are affected in different ways. Globally, there are 800 million people undernourished, 161 million children under the age of five are stunted, two billion people who suffer from micronutrient deficiencies, 1 900 million people who are overweight and 600 million who suffer from obesity. The region of Latin America and the Caribbean is no different: there are 34 million undernourished people, 6.1 million children under age five are stunted, and almost four million are affected by overweight and 38.5% with anemia. Anemia affects 17% of the population of women of childbearing age (between 15 and 49 years old). Over 50% of the adult (>18 years old) population are overweight and 23% are obese. Overweight and obesity cause about 3.4 million deaths each year; this form of malnutrition is associated with the development of non-communicable chronic diseases such as diabetes, hypertension, cardiovascular diseases and cancer. Mentioned diseases are among the leading causes of death in almost every country of the region. The availability of sugar is greater than that observed in developed regions and the availability of fats per capita is greater than the recommended range for a healthy diet, whereas the availability of fish per person is the lowest of all regions of the world, and each year 127 million tons of food are lost or wasted. Confronted with these facts, several dialogue and consultation mechanisms have agreed that it is required a fundamental change in order to strengthen, preserve or recover food systems that guarantee sustainability and the capacity to provide nutritious meals affordable to everyone; incorporating an integrated perspective ranging from the conservation of ecosystems through the more efficient and sustainable use of land and natural resources, improving the techniques used for the production, storage, transformation, processing marketing and commercialization of food, up to the management of food losses and waste and the empowerment of responsible consumers as a prime force in the food system. The Second International Conference on Nutrition (ICN2) held in November 2014, which issued the Rome Declaration on Nutrition and its accompanying Framework for Action in which member countries committed to "enhance sustainable food systems by developing coherent public policies from production to consumption across relevant sectors to provide year-round access to food that meets people's nutritional needs and promotes safe and varied healthy diets." In January 2015, the Community of Latin American and Caribbean States (known by its Spanish acronym as CELAC) approved and adopted the Plan for Food Security, Nutrition and the Eradication of Hunger by 2025. The Plan is based on four main pillars to strengthen the dimensions of food and nutritional security through the generation of policies, programmes, strategies and projects using a multisectoral approach at the national, subregional and regional levels. In September 2015, the 2030 Agenda for Sustainable Development was adopted, based on the premise that it was possible to achieve an integral form of development that harmonize economic, social and environmental sustainability and "that leaves no-one behind." The 2030 Agenda includes 17 Sustainable Development Goals (SDGs), in which nutrition holds a prominent position, reiterating and reinforcing the commitments of ICN2. In April 2016, the United Nations General Assembly proclaimed the Decade for Action on Nutrition (2016-2026), thus creating the political environment favorable for the transforming of commitment into action. In December 2016, FAO and WHO organized the International Symposium on Sustainable Food Systems for Healthy Diets and Improved Nutrition, providing multiple actors with an opportunity to share practical solutions and successful country experiences in implementing sustainable food systems for healthy diets. The Symposium is now being replicating at a regional level, enabling a continue dialogue, engagement and collaboration between country governments and stakeholders. 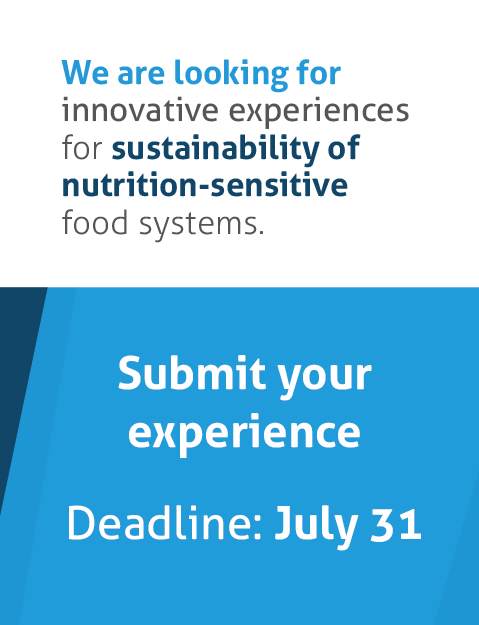 The Latin America and the Caribbean Regional Symposium on sustainable food systems for healthy eating offers the opportunity to consider the challenges and opportunities in shaping sustainable food systems that assure everyone the human right to adequate and healthy food. The Symposium will also convene a multisectoral forum to share practical solutions, successful experiences and lessons learned about the process of recreating sustainable, equitable and inclusive systems in Latin America and the Caribbean. Policies and initiatives associated with the access to and consumption of a diversified and healthy foods: measures to guarantee affordability and promote the sustainable consumption of a diversified and healthy foods. Policies and initiatives that improve intersectoral governance for sustainable, equitable and inclusive food systems. Human rights, life cycle and equal attention to groups in vulnerable situation. Identified the core elements and principles that could define a sustainable, equitable and inclusive food system for healthy eating and bring all forms of malnutrition to an end. Provided recommendations to Governments and other actor of food systems that would enable the design and implementation of strategies, policies and programmes to transform food systems into becoming more sustainable, more equitable, more inclusive and sensitive to nutritional needs. Governments (agriculture, health, social development, education, environment, research institutes, planning, economics and finance, consumer protection bodies), parliamentarians, academics, the private sector, non-governmental organizations, civil society associations or organizations (cooperatives, consumer organizations), international agencies and organizations, and so on.